After baking some Cranberry Meringue Mini Pies last night , there were some extra meringue and cranberries left. I am a 'don't like to waste food' kind of person, decided to bake the extra meringue on parchment paper and serve as a base ice cream dessert . 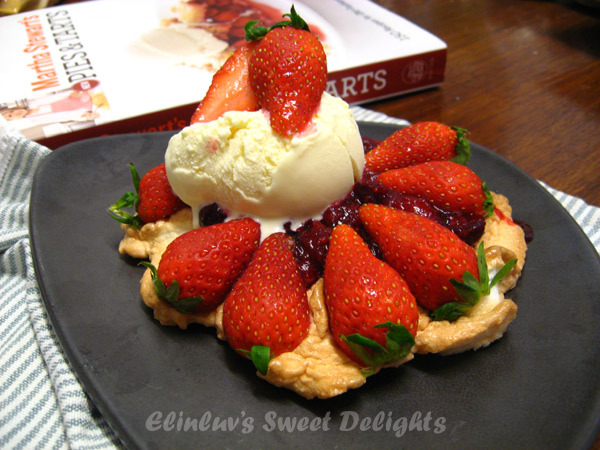 Pour the leftover cranberries sauce on top of the baked meringue and cut some Korean strawberries and arranged them nicely on top of the cranberries sauce. Topped it with a big scoop of vanilla ice cream.......one word YUMMY ! :) The weather was hot so this was a great treat for us ! The baked meringue tasted lovely with the cranberry sauce. I have so much fresh cranberries in my freezer and they are still in good condition. Now I have 2 packets left. Cranberry has anti-oxidant properties and I love the taste of these berries. 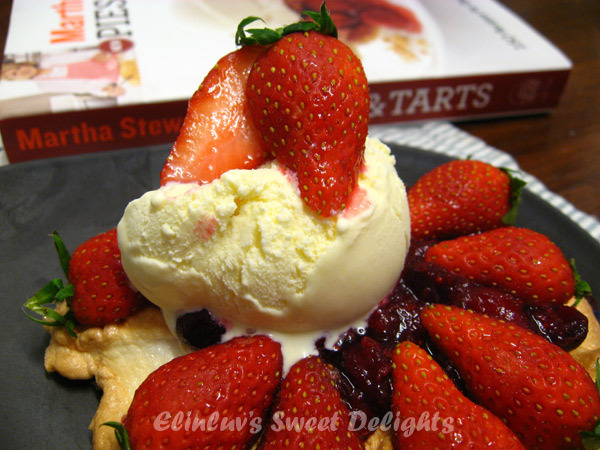 I will be sharing the Cranberry & Meringue Mini Pies in my next post. Do come back for it in the next few days....been pretty busy with work lately, but this Momsie will still steal time to do her blogging :p I have many cookbooks and the most fully utilized are Martha Stewart;s Pies & Tarts and Around My French Table :) I am happy when I can try out most of the recipes from books I bought or someone will OINK down my ears that my cookbooks are for show ONLY ! 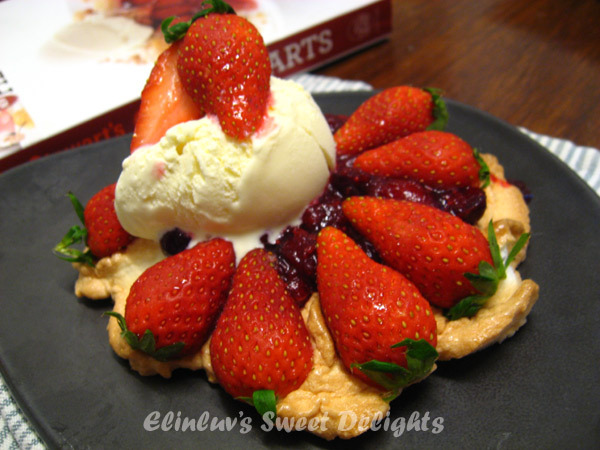 The Korean strawberries are sweet and it goes well with the cranberries tartness....a great combination and I was even more surprised that Wid Boar finished 3/4 of this dessert and leaving me 1/3. 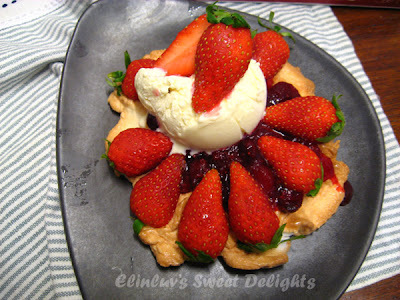 ( of course under my instructions - I cant afford to indulge much even if I wanted to ) I have to add more ice cream for myself....he walloped all the ice cream and most of the strawberries...so it must be really good and delicious! 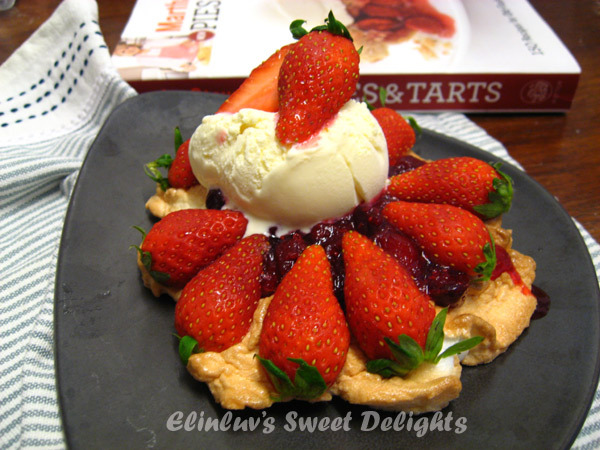 You can make this sweet indulgence if you have some meringue left after your baking. The baked meringue is nice....texture is like mashmallow...mmmm lip-smacking good ! Hope this will bring sunshine and happiness on a Monday morning ! I also made some meringue last week, served in similiar method, except, with greek yogurt bought at Aeon. hehehehe, so happy that we can now buy greek yogurt in Ipoh. Your treat is not just appealing to the palate, it looks really attractive too. Definitely a treat for me, am a strawberry fan. Have to give this a try!